Sash windows in period properties are very important to the overall look and feel of the building. They were designed to be serviced and repaired generally every 12 to 15 years. 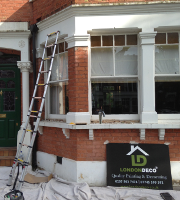 At LondonDeco, our painters and decorators in North London provide full restoration of sash windows. Refurbishment of your existing windows has many advantages. To extend the lifespan of the windows and preserve the historical integrity of the building refurbishment works need to be carried out. These works can be completed without a lengthy manufacturing delay. Without proper draught sealing, dust, dirt and noise all flood into your home and heat rushes out. The refurbishing service of our painters in North London will leave you with smoothly operating windows. It will eliminate draughts or rattles, improve insulation, and reduce noise and dust. Failure to repair rotten windows can lead to even more serious problems caused by penetrating water. At the same time as carrying out draught sealing work, we repair any damaged wood or glazing as well as fitting new ironmongery and locks. First of all, we make sure the area is prepared and covered with dust sheets to keep mess to a minimum. We then remove and check the sashes which are the windows themselves. We remove any rot from the sills and boxes and either repair or replace the wood. The sash weights and pulleys are checked to make sure they are working correctly. We usually fit new ropes when re-furbishing a window and replace broken catches. If necessary we can advise on new window catches and sash lifts. Additionally, new and newly restored sash windows need to be decorated with good quality paint if they are to last and function for a long period of time. Our recommended finishing paints are of excellent quality and value, and they represent a good long term investment. However, sometimes, we find that the sashes are beyond repair. If this is the case we will always recommend partial or full replacement. Before starting any job, we will give you a detailed quote including all the costs of making, painting, glazing and fitting work. LondonDeco is a local company of professional painters and decorators in North London area dedicated to delivering high customer satisfaction. We are a small, friendly team of qualified painters and decorators in North London experienced in delivering the highest quality painting and decorating service on every project. Our painting and decorating works are carried out primarily in areas such as Muswell Hill, Islington, Highgate, Camden, Hampstead and other parts of North London and across London.